The Montessori classroom is an environment which is carefully prepared by the teacher. The whole learning environment – room, materials and social climate – must be supportive of the learner. The Teacher provides necessary resources, including opportunities for children to function in a safe and positive climate. The focus of activity in the Montessori setting is on children learning, not on teachers teaching. Generally students work individually or in small, self-selected groups. The Montessori method strives to give the child the independence and self confidence necessary to become life-long learners. The social and emotional growth of a child is crucial to the Montessori Method. The Montessori classroom is a safe and warm environment where children develop social skills and a sense of responsibility for their own behavior within the greather school community. The Montessori classroom is a comfortable, clean, safe and nurturing environment specifically tailored to encourage age-appropriate exploration and learning. The Montessori classroom is very different than the traditional model in that it is designed for active exploration by the child. The essential difference in theory from a traditional classroom is that instead of information passing from the teacher to the student, the teacher is putting the child in touch with the environment. The classroom is set up with centers for each of the five main areas of learning. Practical Life encompasses the activities of daily living which allow for a child to become independent in self care and care of his or her school and home environment. The four distinct groups of practical life exercises include: Care of Person, Care of Environment, Development of Social Relations, and Movement. 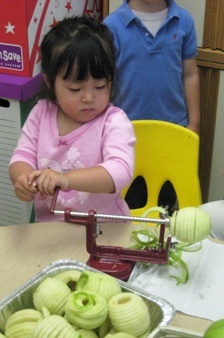 The Practical Life area of the classroom is filled with child-sized tools that work. Using these tools children will learn pouring, sweeping, scrubbing, buttoning and polishing, among other skills. In addition, they will learn to serve themselves snack and clean up after themselves. These activities are very meaningful to the young child, they are easily imitated and appeal to the child’s will. Mastery of these skills furthers the development of greater physical skills, perfection of movement and concentration. Sensorial exercises are those pertaining to the development of the five senses. Through experiences with sensorial materials, children will learn to comprehend and classify the world around them. Children in the Montessori classroom learn to order, classify and describe sensory impressions in relation to length, width, temperature, color, etc. Concepts such as length, height, shape and color are learned using attractive materials that are interactive and self correcting in their design. These skills provide the foundation for speech, writing, mathematics and music. In a Montessori classroom children are exposed to numbers and their meaning in a variety of concrete ways. Children learn mathematical concepts through the manipulation of materials such as rods, beads, spindles, cubes, cards, and counters. It is through the use of these concrete materials that abstract mathematical concepts and operations are attained. Maria Montessori taught that concepts are best learned through concrete manipulative experiences which bring together the mind and the senses. The Montessori teacher prepares the environment with appropriate materials to achieve these goals. Children then are able to freely explore their environment, manipulate, and learn mathematical concepts. Language includes the development and refinement of oral language, written language, reading, grammar, creative dramatics and literature. The Montessori classroom is a language rich environment where children are encouraged to take part in verbal discussion through lessons, story telling, sharing times and reading. 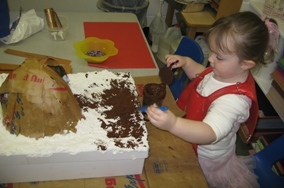 Children build important pre-reading and pre-writing skills through the use of materials in the classroom including, hands on sandpaper letters where children begin their journey into the written word. Experiences with word building, reading and writing are introduced when the child is ready. Cultural lessons in include geography, science, history, nature study, music and art. Materials are specific to the cultural concepts being discussed. Montessori cultural education is important to help the child develop his own personality, adapt to his own culture, and become an independent, useful member of his society. Only then can he go on to become connected with the global community. Montessori children are extremely adaptable. They learn to work both independently and in groups. Since they have been encouraged to make decisions from an early age, they are natural problem-solvers who make appropriate choices and manage their time well. Dr. Montessori’s observations of the kinds of things that children enjoy and go to repeatedly led her to design a number of multisensory, sequential and self-correcting materials that facilitate the learning of skills and lead to learning of abstract ideas. 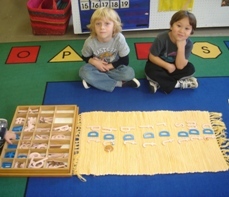 Montessori materials are attractive to children and inviting to play with. The materials are self correcting, meaning when a piece does not fit or is left over, the child is able to easily see his error. The child then corrects himself, learning to problem solve independently. Problem solving independently builds self confidence and analytical thinking. To learn more, visit the American Montessori Society website.